The ever-informed Ming-Chi Kuo of KGI Securities (via MacRumors) has released a new report predicting Apple’s product launch schedule for the bottom half of this year. He suspects that Apple has all new iPod touch and nano models in the pipeline, as well as a new iPhone and the much rumored “iPad mini”. On the Mac side of the equation, Kuo reinforces his previous claim that Apple will be pushing out at 13-inch Retina MacBook Pro sometime around September or October ahead of the holiday shopping season. He also notes that due to limited supplies and consumer budgets, the new iPhone and iPad mini will sell better in this timeframe. That said, he believes significant growth is ahead of the Retina MacBook Pros going into 2013. Kuo believes that a new Ivy-Bridge equipped iMac is experiencing problems in the screen lamination part of the manufacturing process, and this is leading to the delay. 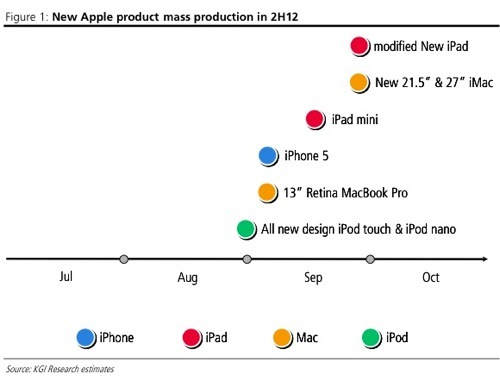 Of course, this fits nicely with other reports which claim that the new iMac is due for an October release. So, expect a big product refresh for this holiday shopping season: new iPods, new iPhone, new iPad mini, new MacBook Pro and new iMacs. I’m looking forward to it.